To continue the sports metaphor, Dannie Abse, nearly 90, is still at the top of his game with his 17th book of poetry. Imagine Andy Murray winning Wimbledon at age 60. 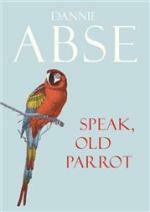 Abse’s ‘ventriloquist’ old parrot is the inner inspirational who encourages him to continue by citing Hardy and Yeats writing in their advanced age. In the mildew of age// all pavements slope uphill [with regret for] those yawning postponements on rainy days,/ those paperhat hours of benign frivolity.// Now Time wastes me and there’s hardly time/ to fuss for more vascular speech…Quick quick/ speak, old parrot,/ do I not feed you with my life? (‘Talking to Myself’). Thus the collection opens. And it closes with the parrot’s reappearance in ‘Gone?’. The parrot wears purple and white feathers – a trope Abse has used before, purple for the royal garb of poetry, white for the mantle of medicine. You only spoke when compelled…Always your style was in the error…Now I’m tired and you nest elsewhere./ Bird, your cage is empty. Will you come back?/ I see no feathers in the wind. A final soliloquy, perhaps, yet leaving the cage door open for the smallest chance that the old bird still has a voice. And what a voice. By turns sad, gently ironic, funny. In the trope of age and obsolescence, for instance, ‘The Old Gods’ are worn out, meagre. Venus’s pubic hairs are grey. Glum Bacchus talks ad nauseam/ of cirrhosis and small bald Cupid, fiddling/ with arrows, can’t recall which side the heart is. Abse writes in free verse, but buries rhymes and near rhymes nearly imperceptible to the eye yet echoing across lines and stanzas: fact-act, choreograph-explorer, poet’s-wrote-woodnote, undressed-blessed, urn-taciturn. The musicality drives the poetry, engages the listener to listen, echoing the music of other famous Welsh poets. Abse, born in Cardiff, channels the voice of 14th C Welshman Dafydd Ap Gwilym who was the first of the bardics to describe ordinary human life with himself at the center of the poem – bawdy, funny, self-mocking. Abse’s five poems in ‘The Summer Frustrations of Dafydd Ap Gwilym’, continues in that tone. The fifth poem ‘Letter Not Sent’ on the surface is ostensibly a wry farewell to a former lover who has entered a convent and is no longer accessible. Beneath the surface, I believe, the poem turns poignantly tragic – a paean to his wife Joan, killed in a car crash. I’d ignite into a fine-glowing ember. Was it all like a promise made in wine?…. Note that Abse considers himself both a ‘Dafydd’ – Welsh – and a ‘David’ – Jewish. Dafydd and David both composed and sang poetry while playing the harp. There may be a shared bitterness in the two cultures struggling for survival. In ‘Wagner’ one trenchant memory emerges: Outside the Hall even your statue, moon-blown,/ stone-deaf, smells of the urn; and ghosts soaped/ in moonlight weep. [Soaped!] The Streets of Germany/ are clean, like the hands of Lady Macbeth./ And does your stern distinguished statue keep/ vigil for another Fuhrer’s return? Some statues never awake,/ some never seem to sleep. Do you hear the echo of Yeats’s ‘Second Coming’? In ‘Portrait of an Old Doctor’ Abse reminds us of his other profession, medicine, and how anaemic his training was at a time when he could only offer Blunderbuss drugs…And moonbeams… No applause. None for Hippocrate’s art. Yet he would still insist on the compelling truth in the old professor’s teaching: ‘Cure sometimes, relieve often, comfort always’. His late wife Joan was his ‘Beatrice’, as the poem ‘Parrotscold’ tells us. ‘Scold’, because some years after her death he has forgotten their anniversary, and dines alone in some déclassé bistro. Are there also amyloid moths in your memory?/ It’s your anniversary, stupid. Isn’t her name writ/ more in your blood than on bloodless stone? If one had to choose a favorite, mine would be ‘Both Eyes Open’ – a fantasy of a tall artist painting the portrait of a smaller artist sketching a landscape, but adding in a small bird; while the poet word-paints a singing bird hidden in the tree/ which neither of the painters painted./ I wait for it to fly out of the frame. Plato’s cave redux, and an infinite regress of images as we the readers observe the poet leaping off the page. This is how Abse’s poems reveal deep meaning from small gestures and vignettes. For another example, ‘The Bus’, comprises two poems tracing and retracing a Wales rural bus route along the sea (‘Llantwit Major to Bridgend’, ‘Bridgend to Llantwit Major’ – the driver passing by bucolic scenery and ‘soul-feast of horizon colour’. Unlike Elizabeth Bishop’s peopled Maine bus ride in ‘The Moose’, there are no passengers and the driver is depressed: what was the point of it all unless/ the journey exploded into meaning? Which it does, for those of us who keep our senses open to the magic of simply being alive: the bus arrived empty, yet terrific with light. What distinguishes Dannie Abse’s poetry is his voice: strong, clear, gentle, passionate, ironic, proud, melancholic. We keep our senses open to his magic, terrific with light.